The most visually obvious reason for my excitement is due to how beautiful this game looks. This shouldn’t really be a surprise considering how good the previous title looked. I certainly love the high-definition capabilities of my PS3, but that doesn’t mean standard-definition can’t still look fantastic. 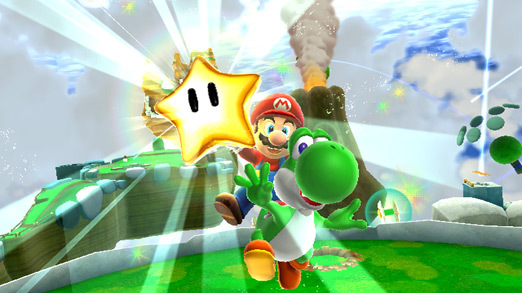 The introduction of Yoshi is another great addition. He was certainly missed in the previous game, but that did leave Nintendo with a solid addition for this title. It seems he’ll have many of the same abilities that we’ve seen in other Nintendo titles. In addition to those abilities, it seems there’ll be berries that he can eat in order to get speed boosts or the ability to float. These bring back memories of Super Mario World leaving me quite excited. 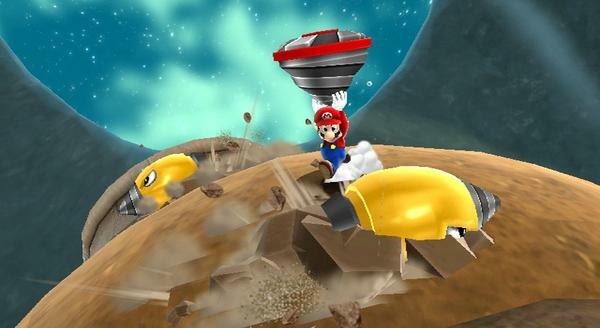 As with all Mario games, the new power-ups are always exciting to see. I can only hope the Ice Flower makes an appearance in this game. One of my favorite memories of SMG was realizing that I could freeze a waterfall and wall jump to a higher platform. As always, I’m looking forward to seeing what unique and interesting uses the guys at Nintendo can come up with for the various types of abilities Mario will be able to employ.